This was an unlikely choice for me - an old white male's collection of short stories - but I heard the author read at a literary event and there was something about his voice that grabbed me. So I bought the book, and really enjoyed it. So many contemporary short stories are so pretentious I find, but these are just solid good stories, set in either Berkeley, where I live, or on Long Island, with mostly a middle-aged or elderly male Jewish protagonist - but it was the humor and quirky plots that kept me engaged. A man who sets up a weekly Irving Horowitz support group for guys who share the same name, and the way his life is turned around when an African American named Ervin turns up. A guy who becomes obsessed with getting a particular sweater on sale, traveling from NY to Florida to buy it as his mother is dying. And the title story: a man who takes the altruistic act of donating blood marrow to a compatible donor to ludicrous extremes. Levine has a dry sense of humor and a clever way with words to carry these stories through. Richard M. Levine - Richard Michael Levine has written magazine articles for many national publications, including Harper’s, Atlantic Monthly, Rolling Stone, New York, The New York Times Magazine and Esquire, where he was a contributing editor and wrote a monthly column on the media for a number of years. He has been a staff writer and editor at Newsweek and The Saturday Review, received an Alicia Patterson fellowship, and has taught at the University of California at Berkeley Graduate School of Journalism. His bestselling non-fiction book, Bad Blood: A Family Murder in Marin County, was published by Random House and the Penguin Group and has been translated into several languages. His poetry has been widely published in literary magazines and anthologies and collected in Catch and Other Poems. 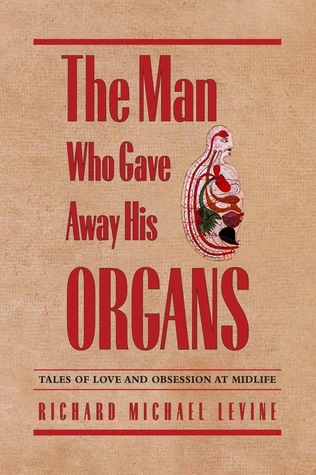 His short story collection, The Man Who Gave Away His Organs: Love and Obsession at Midlife, was released on July 10, 2015 by Capra Press.